I hate hospitals. A good chunk my day a couple of weeks ago was spent dealing with an unexpected event that landed me in one. The morning started in the wee hours with the birth of a so far seemingly healthy foal at Halcyon Acres®, but admiring and bonding with this colt (four symmetrically stockings and a lovely blaze – sadly, it looks like this flashy chestnut may turn gray as he’s already a bit roan) would have to wait. For the two hours immediately following the incident, I waited to hear back from my doc concerning her recommendation on an ER with a plastic surgeon as I worked to stem the bleeding, showed a client horse to a potential taker, gathered a couple of horses that jumped the fence as they watched me dally with the visitors well past their lunch hour (those Irish Draught Sport Horses are expressive critters in so many ways) and tried to recalculate my day. Actually, I chuckled at Clover and Shaquille’s guile– they jumped out of the nine acres they were in to get into the fenced area I was in and insisted on joining the powwow with the ultimate takers of this client filly. As they ran down the hill and planted themselves in front of me, it was obvious what they thought of my negligence (fortunately the human guests had a sense of humor). I understood their frustration – I was living it too as my planned day unraveled – fortunately the fix was easy for the equines as I simply opened the gate and they threaded into their designated stalls unfettered. Horses thrive on routine and get unsettled when humans don’t honor their plans. They’re not so different from us in this respect. Who among us gets giddy when someone or something throws a wrench in our day’s plans? Funny, I debated skipping lunch with the farm herd as I spent an hour trying to get back my senses and figure out how to modify the day’s plans to make it work. Maybe my two smart, expressive athletes picked up on this energy and decided they would have a say. Who knows? Still, as much as it hurt to do so, their impudence put a smile on my face. Actually, I don’t even think that’s a fair assessment of their intent – they just wanted to be heard and figured out how to make it so. Since I hadn’t heard back from my doc, I decided to keep a phone interview appointment for a radio show. I discovered if I lay on my back on the couch in the office, I could talk without saliva pouring through the hole in my lower lip. We had fun talking about horses – and how differently each processes information and responds to human personalities. Ultimately, I opted out on my doc’s recommendation for a hospital, realizing the I’d probably be waiting many hours as gunshot wound victims moved ahead of me in queue. That, coupled with the associated harrowing trip back to my car and the realization that the specialists earmarked for my case would likely be off the clock, led me to choose a closer hospital. Stopped by my vet’s house to get her opinion on the severity of the wound and the wisdom of choosing a closer hospital to stitch me up before finalizing plans. It’s funny how horses respond to the unexpected. As is usually the case, I found the horses picked up on my angst (and, of course, responded to the change in their schedule) but the ones with a tendency to be difficult at times were kind, concerned and accommodating stars. It’s amazing how any time I’ve been sick or hurt, the ‘problem’ client horses are the first to pick up on it and alter their behavior to take care of me. Irish Draught Sport Horse filly looking sweet. The two in this picture are not her mother. Mom allows nursing but has rejected her (first time ever with this super dam) for all other interaction. Crooked (the names I’d choose for her now are less polite), however, is another story. There’s no telling where this came from (certainly not her mom, herd mates or me), but she’s vicious. In the last couple of weeks she’s decided the only good use for her teeth and feet are as weapons – and she recently added her neck to the list. A healthier state has produced unanticipated behavior like I’ve never seen in a foal. Of course, we’re known for effectively reaching and guiding such client cases with older horses, but I’m scratching my head about this anger and violence so uncharacteristic of a young foal. Time will tell if this is behavior that can be addressed or a product of a birthing challenge that would have prompted her mother to mercifully leave her for dead in the wild. Sometimes we humans go to extremes to save a horse that might not be equipped to deal with life. I’m now done eating my meals through a straw. The loose teeth will tighten. The swelling will subside. The gash on Crooked’s neck caused by the teeth that went through my lower lip with enough force to pierce her skin has healed. Our relationship is strained. So, I’m giving her 30 days of virtually no contact to see if she grows out of this hostile persona and learns through watching other horses relish attention that people can be friend. 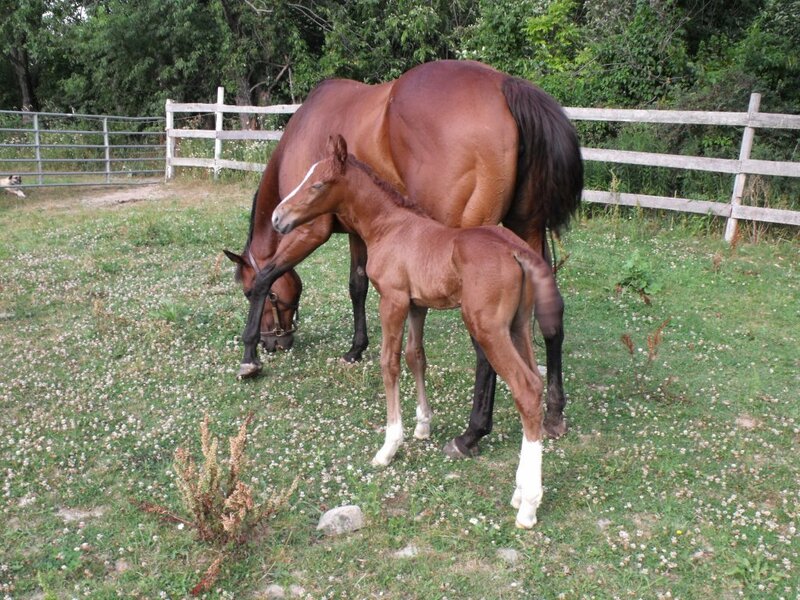 Her nurturing filly friend is gone and now mom has stepped up to keep track of her. That might be a good thing. Time will tell. Do horses celebrate the Fourth of July? Independence Day is a cause for celebration in the United States. Picnics, fires, fireworks and lots of noise seem to represent the holiday activities for most. The last few years at Halcyon Acres® they’ve also been marked by a next-door neighbor (as close as they get, anyway, out in Podunk) with a month-long fascination around exploding loud objects from his back yard over the fields at our farm. While the sound of fireworks has always been a bit too much for my ears, the visuals are something I relish. Never did understand what was so captivating about the noise. Today, though, as I hear the audible signals of area finale displays way off in the distance, I smile at the visuals I see culled from memories of years gone by. Getting back to the fireworks fiend (he’s closer than any other as his one-acre corner home property was carved out by a prior owner for his son, who moved away decades ago) it’s weird to have someone in the country so enamored with such expensive toys. The booms and bangs at all times of the day are tough for the horses to deal with, but the farm herd has become used to it. Client horses can be another story as the racket blasts over their heads during our otherwise peaceful rides. At first, I was irked by this intrusion and hazard that was the product of ignorance. Clearly, he was just having fun with no idea these ear-shattering explosions might unsettle a horse. It might have been easier to take if the uproar was limited to a few days surrounding the holiday, but his penchant for lighting a fire to loud missiles extends far prior to and after the celebration day. Then, I realized this could be used as a good training opportunity – talk about bomb-proofing a horse, literally. Is it fair to ask a young horse starting under saddle to endure this – probably not. Do they learn to handle it over time – yep. Makes for a bit of a rockier ride initially, and hard on my already destroyed back, but I’ve come to realize this is yet another way to help young horses learn how to handle frightening issues while gaining trust in their rider to keep them out of harm’s way. To come full-circle, the idea of Independence Day on a farm teeming with horses begs the question, do equines relish freedom? It depends. Sure, they all enjoy and need time to kick up their heels and bond with a herd. When you really get watching, though, horses seem to prefer a guide. Even the alphas (the vicious horses aren’t such – they’re almost always reacting from fear) enjoy another stepping in for a day or month or more to take over the responsibility of leading the herd. All seem happier when engaged in a job that involves humans. The most troubled that have come through Halcyon Acres® have been those that haven’t been able to find a leader they respect and trust. It’s funny how the herd leaders seem to be the most adamant about expressing their desire for training time. It’s an interesting animal these equines have become. Who knows if it’s due to eons of selective breeding for domestication or if there’s something natural about the horse/human connection, but it seems most horses would prefer to be heard as a team member in a partnership rather than a life where they’re left to be free of human interaction. Maybe we all could learn something about the notion of independence from these animals. How do you celebrate the Fourth of July? Please share your idea of a good time in the comments below. This winter a young gelding came into Halcyon Acres® for starting under saddle training that presented a host of challenges. He was dangerous to himself and the people around him because of the way he processed (or didn’t) information. His reactions to imperceptible stimuli were explosive, yet he’d handle things with ease that would freak out a typical young horse. There’s a magical moment when you find yourself so connected with a horse that there’s no need to grip, anticipate or concern yourself (much) with going off. Interestingly, it’s often less about the horse and more about you. Recently, I was talking with a non-equestrian about this light-bulb moment. She likened the experience to finding your center in martial arts. This is the best analogy I’ve heard offered for this Zen-like experience. Funny it didn’t come from a rider or trainer. Sometimes being able to express what’s really going on with horses takes objective perspective from someone who doesn’t understand, yet does in uncanny ways. How’s a novice rider to know? Halcyon Acres® hired a gem about five months ago. She came with no horse experience (not in her mind – she spent a day on a horse and mucked a couple of stalls). Fortunately, she’s a quick leaner and great about asking good questions. One day she queried what she should be doing differently to stick with a horse that starts to buck. Long story short, this gal came a long way with very frequent riding lessons and was eager to try one of the young horses in for training. This filly had two months of riding time under her, but she’s goosey and will react if you knock her in the elbow with a toe (get the picture?). My knee-jerk response was more mileage. I was wrong. The better answer is finding your center. Time in the saddle has little to do with being one with the horse. There are professional riders who will never get it and some rank novices who make the connection almost immediately. A former jockey turned exercise rider at the track has the shortest legs I’ve ever seen. Many years ago I asked him how he sticks with these horses that buck, wheel, bolt and perform other maneuvers that would dislodge many others able to wrap their legs around a horse. He said so long as he has his stirrups, he’s fine. Now I get it. Used to be I’d drop my stirrups when faced with a bad actor. Today I’m better off with them – no matter how short they are. The moment you start gripping with your legs, you lose that connected balance with a horse that lets you naturally flow with their movement – no matter how athletic these moves may be. It’s the seat that’s your center – and once you detach a calm, relaxed, flowing and perceptive feel of the horse’s back through your buttocks, you compromise this critical connection for oneness with the horse. Does it really matter how your body parts lay on a horse? So much of equitation instruction focuses on where you place your body parts. I suppose there’s a rationale behind this ideal, but every rider and horse balances differently. While a pretty picture may win you ribbons, it’s not likely to set you on a path toward flowing with your equine. In fact, some of the precepts work against a position that enables you to relax into the motion of the horse. Driving your heels down, keeping your knees in and pointing your thumbs up are among them. If you’re short-legged and long-waisted finding your rhythm on the horse is going to look a lot different than it would for someone who has long legs and a tiny torso. If you’re longing for that ah-ha moment where you feel such oneness with the horse underneath you there’s no need to anticipate what they may do next, let go. Gripping with the legs, tightening the reins or tensing up only serves to separate you from the movement of your equine partner – and the possibility of finding that nirvana where you are one together. Shorten your stirrups so much your seat must help you stay with the horse. If you can’t depend on your legs for gripping or balance, your seat becomes the necessary fall-back (and the appropriately critical fulcrum for every other part of your body in how it connects with the horse). Let go of the reins. Tight contact isn’t going to stop a horse from spooking or spinning. In fact, holding the reins short is only going to increase your tension and transmit it to the horse. Plus, it makes your upper body pitch forward, disturbing your balance and making you more likely to go off the horse during a quick move. You can still hold a horse from a wheel with a long contact that has legs and seat ready to direct the energy forward. Loosen the legs. Gripping with your knees or thighs will push your seat out of the saddle and cause you to lose a natural connection with your horse’s movements. If you’re on a young horse or one that is prone to spinning, lurching or leaping, put your legs forward a bit and grip with the back of your calves. This will put you slightly behind the motion of the horse, but that’s a better place to be when they screech on the brakes, throw their head down for a buck, boing sideways or wheel away from that killer ghost. Relax. Granted, it’s hard to be quiet and comfortable when on a mount that has a history of spooky behavior, dumping riders or being unpredictable, but if you’re tense, you’ll never be able to go with the flow – and your horse will feel that angst and be more reactive. Remember to breath (deep breaths really do help). Embrace groundwork. You’ll be amazed at how much you can do to build a rapport and understanding with your horse that translates to remarkable changes in behavior under saddle (for both you and your horse). This doesn’t mean drilling him in a roundpen or using treats for tricks, but instead, finding ways to communicate, build trust and develop a rhythm that transcends all future team activities. Grooming, liberty work, line driving, pasture connections & communications, walking in-hand on the trails and basic leading and handling activities can go a long way toward improving riding time for both of you. Find the fun. So much of what’s been popularized these days involves the human setting pre-determined goals for the horse and drilling them until they comply. If you’re not looking for things that make your horse happy, he’ll be tense and uncomfortable. You can’t easily find this centered place on a stiff and resistant horse. Sure, you can learn to get good glue, but what’s the fun in that for you? It’s a wonderful and awakening moment when you discover a peace, balance and confidence that has you comfortable aboard an athletic and unpredictable horse with the realization you’ve found the key to how to be on their backs in a way that has you with them for almost anything they may do. Better yet, why not develop an approach that keeps both of you happy, confident and connected? I hope you are able to experience the wonder of cool confidence on a horse that has you so connected with their movement you feel as one. It’s even more rewarding when your horse feels the same way. How’s your horse voice working for you? Conventional wisdom isn’t always right. For decades I’ve heard (and read) from a good number of equine professionals (along with the studies they cite) that the human voice is a poor choice for a training tool. The argument is horses can’t easily decipher our words. Maybe reciting Shakespeare isn’t going to lead to mass absorption, but most horses can understand a word or few at a time used consistently. We nickname every client horse that comes into Halcyon Acres®. The reasons are many, but the short answer is many don’t come in with names and the ones that do tend to have long, convoluted registered monikers that are too hard for me to remember or say quickly, so it’s doubtful the horse minds a shorter and easier identity. The important result is every horse at the facility comes to know his name. Today, I was struck by how critical such a simple practice can be in potentially dangerous situations. Three older, bigger and more spirited horses in for conditioning training managed to open the gate separating them from a herd of mostly three-year-olds in for starting under saddle work. This could have gotten ugly, quickly. We’re pretty careful about how we select turn-out groupings. These were two gangs that didn’t belong together for a lot of reasons, not the least of which being the likely resulting considerable vet bills. Fortunately, the farm horses were being fed in close proximity when this occurred, so the mixed herds didn’t have time to mingle for long. As luck would have it (sometimes you make your own luck) the three-year-olds were accustomed to a routine where they were released into a long chute with a temporary gate at the end that led back toward the barn at evening feeding time. The older horses were not. A funny thing happened next. Just as the screaming, striking and kicking was about to get underway, I called the most aggressive three-year-old filly. Hearing her nickname, she jerked her head around to see me at the gate. I hollered ‘come on’ (that’s the dinner bell) and she started walking over. Getting her out of the fray reduced the likelihood of all-out war (predicting the behavior of certain horses helps in such cases). Once ‘kick ‘em ‘till they gush’ was close enough to grab and send down the chute, I called the gelding that guides the young herd to the designated paddock and back to the barn. The ‘meet and greet’ was just about to get bloody, but this good kid (he’s classic ADD much of the time, so you never know) turned his focus immediately to the call-out of his name. Once the other two pasture-mates saw his lead, they trotted off behind him through the gate and toward the barn. Since the older horses were used to waiting at the gate to be led in one at a time, it didn’t occur to them to try to shoot through. In a matter of about two minutes, some simple voice cues segregated the horses and averted a potential crisis. Body language certainly wouldn’t have worked here as whole focus was on the war drums and choosing a sparring partner. Would you want to be the human putting yourself between these hoofs with visual cues? Food rewards wouldn’t have allowed smart culling and would have probably escalated the situation as aggressors beat off others for first dibs. Think discipline or fear would be an effective motivator here – yea, right. Simply having a crew of horses who were used to being addressed by name did the trick. These were horses that trucked in during the month of December, so this didn’t require years of conditioning. Merely making it a daily practice to greet and instruct horses by name had each acknowledging that designation in less than two weeks. Can you voice your opinions with your horse? Some horses respond better than others to the voice, but most can learn what you mean if you’re consistent with the words, tones and rewards. Many use and cite food as a primary motivator for horses (it is), but I don’t. Yes, there’s always at least a handful of grain in a tub to reward farm-owned horses for going to their designated stall unfettered, but for most training activities, the voice can come to be as effective a reward as a treat. This is particularly true with horses that are pleasers. Sometimes a ‘good girl’ means more to such equines than a cookie. It also makes it a lot easier to make your response immediate and encourages your horse to be a thinker and a partner rather than a trickster for treats. Recently, I read (scientific studies) that horses are now believed to have a wider range of hearing than dogs. Survival of wild horses has been credited, in part, with their ability to associate subtle sounds as forewarnings (such as the tone of bird chatter) of danger. It’s not such a stretch to conclude consistent voice cues can be easily understood by the horse. Often, people give horses less credit for intelligence and adaptability than they deserve. You might be amazed at how quickly your horse steps up to the challenges you offer if you’re willing to listen too. Why not explore how well your voice can work for you as part of your strategy in ‘talking’ to your horse? Equine behaviorists have been questioning the methods others are touting as kind or natural approaches to training a horse for a long time. This might be the year more become public and passionate with their convictions. Let’s hope so, as such credentials carry some weight and might even turn a few heads. There’s nothing inherently natural about throwing tack and a rider on a horse, yet when brought along right, most horses seem to prefer having a job that involves partnering with humans to being left alone in a pasture with a herd. Unfortunately, most of the celebrated methods du jour stress out the horse beyond the owner’s imagination. That’s not good for the horse, and it’s certainly not a productive approach for building a good relationship (can this really happen if one is making all the demands and the other is expected to comply?). 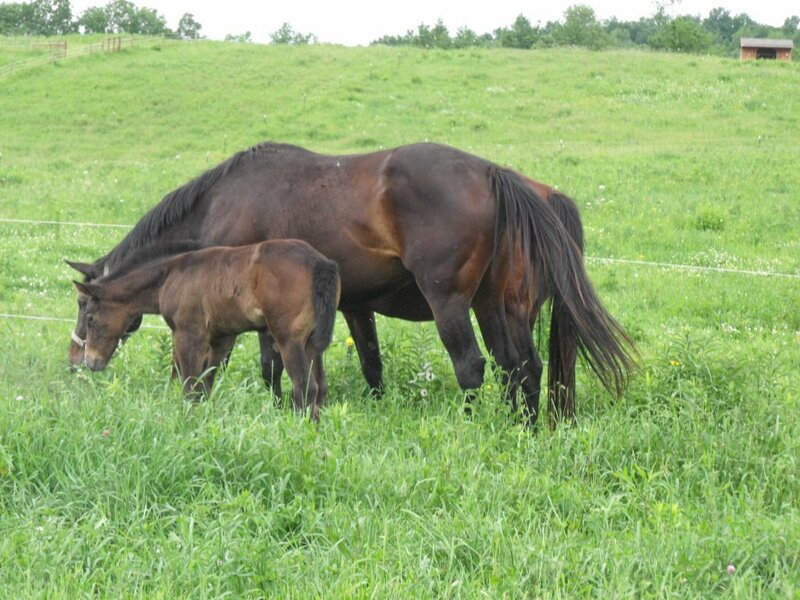 It’s no secret that Halcyon Acres doesn’t buy into many of the popular (and sometimes very old school) methods of trying to fit any horse into a formula training approach touted to work for all equines. All of these methods fail to include the horse in the conversation – so they’re destined to leave the humans who embrace them (not to mention the horses) frustrated and confused. The tricks are at the forefront. Few provide guidance on how to read and respond to a horse in a way he can appreciate and understand. Round pens are way over-used (and misunderstood) in the United States, and apparently this is now becoming an even bigger problem in the UK and Germany as Pony Clubs and Universities are partnering with marketing machines to encourage methods that label terrified surrender as a bonding experience. If you think your horse learns to trust you because you run him around in a restricted circle until he’s exhausted, think again. Some practitioners boast ‘licking and chewing’ as a sign of submission and associated respect (and this is something to be proud of? ), but this can also signal stress. Do you really want your relationship with your horse to be built on escapist acquiescence? Sure, he’ll likely follow you around once he realizes that’s the only way to get some relief, but that doesn’t mean he likes or trusts you. He’s just trying to survive. You may not want to be on that same horse when you need him to help you get out of trouble. Sometimes, it’s better to have a horse that has been encouraged to think and participate in solutions than one that’s been conditioned to accept a life of mindless servitude. The problem with round pen training (and the tool itself can be very useful with some horses – provided the training involves activities that include the horse in the conversation) is that most present it as a method for doing something to the horse, instead of with the horse. Those that implement the techniques offered as fix-alls don’t understand how to read and effectively communicate with a horse – a piece the gurus tend to forget to mention. It’s sad to see the fallout for both horses and humans as formulized precepts go very wrong. Since most seem to view titles with acronym suffixes as more credible (and the time and money they spend gaining these credentials should be recognized), let’s hear what they have to say. Special thanks to Stacey Sheley for pointing me to this article and Cavallo Magazine for supplying the quoted content. Horse crazy or crazed – now what are going to do? Yes, it’s a long post. Still, maybe those who took the time to read through to the end learned something today. I know I certainly did as I read through the entire article (I’ve condensed it a lot in effort to cull the most salient points for you). Just because someone is popular, quoted, wealthy or celebrated doesn’t mean they know it all. The next time you put your horse in a round pen, consider how what you are doing may be interpreted by (or hurting) him. One of the greatest things about horses is they can help you grow in really big ways – provided you are open to hearing what they’re trying to say. Instead of trying to make your horse fit into your program plans, why not ask him to help you learn? With a watchful eye, an open mind and a flexible attitude about what you’ll tackle with training today based on how your horse is responding, you may find your rewards are far greater than you imagined. If your aim is to build a partnership that has you awestruck by how much your horse will do to help you, get out of the round pen and start bonding with your horse through activities that give both of you the freedom of expression and input. Novice or professional, one of the most important thing you can to do start building better relationships and realities with the horses you work with is to adopt how you approach training in a way that considers the horse’s penchants. Learn how to discover what these are through conversations with your horse and you’ll be amazed at how quickly you progress. Want a horse to protect you? He will if you’re willing to hear him. This quote grabbed me – not only due to my logging more than twenty years as head of a marketing firm that encouraged clients to embrace an inverse pyramid approach to selling, but also because of the wonderful application this idea has in working with horses. Well, maybe horses are more forgiving than humans, but they remember. Plus, anyone who thinks they’re “teaching their horse respect” with what they do to the equine vs. how they relate to him is living in a dream world. Sure, you can gain his fear, her obedience, his compliance and her cooperation, but you’ll never win a horse’s trust with an end-game in mind that doesn’t include the equine in the conversation. While it’s not fair to try to put the human ego into play when characterizing horse emotions, horses that are valued, understood and encouraged to be partners in a job they can embrace (and accomplish) tend to be a lot happier than those that are conditioned to be robots, schooled into submission or left to languish with no horse/human work activities. Appreciated and included horses will do amazing things to tackle the challenges you face together. Respect is a two-way street, whether you’re talking person-to-person or human-to-horse. Lose sight of this and your relationship with your equine partner is more likely to be built on fear or pain than trust. If a partnership with your horse is your aim (some would rather have minions), where both contribute to solutions as you face challenges together, you need to be able to hear and acknowledge what your horse is trying to tell you. You might not always agree with it – and it’s OK to say no – but if you’re looking for a lifelong bond that’s reciprocal, it’s important to let your horse know that you’re listening to his input. Trust and respect are built through what you do with the horse – not what you do to him. Too often, people dismiss their intuition when it comes to building relationships with horses in deference to one who presents themselves as a guru that promises fool-proof results if you buy (or buy into) their system. If something doesn’t seem right to you, or for your horse, don’t do it just because a media darling says it’s so. Every horse has his own character and individual reactions to what you throw at him. No one can honestly assure a standard response to a given approach. Seek out a variety of perspectives and solutions as you strive to learn how to more effectively reach your horse, but trust your gut. If your horse is screaming ‘stop that’ or has lost the spark in his eye as you force him through a series of lessons devoid of his input and focused on making him a compliant servant, consider rethinking your strategy. The relationship building process can be a wondrous discovery process where your horse teaches you as much (some would argue more) as you train him – provided you are willing to include him in the conversation. Come at him with assurance, patience and understanding to give him the confidence and kind direction he needs to please, and you’ll be amazed at how much more he’ll want to do for you. Do we really want to try to train horses to be unflappable? This whole notion of ‘bomb proofing’ a horse might make sense when circumstances involve city crowds, physically challenged riders or Civil War reenactments, but ‘desensitizing’ has gone way overboard as a general training premise. At Halcyon Acres®, we get a lot of cases where playbook approaches designed to mollify the horse have gone terribly wrong. Think before you leap on a bandwagon. The desensitizing process, as it’s been driven into the minds of those placing guru status on some of the more notable names in the ‘natural horsemanship’ movement of the moment, ignores the horse as an individual that deserves to be considered in the decisions. Even if you don’t think the horse should be part of the conversation, if you fail to incorporate his personality and issues into your training plans, you’re bound to get hurt. Unknowing handlers and riders trying to follow a formula ‘anyone can implement’ tend to create long-lasting issues that either condition a horse to tune out and/or cause him to explode immediately or later as memory receptors are triggered when frightening early training issues resurface. For most riding situations, a thinking horse is a safer steed. This holds for basic handling issues as well. If there ever was a topic that called on Horse Sense and Cents™, this is it. Instead of throwing tarps or flags or plastic bags at the horse, why not consider building trust instead? Most horses, when introduced to early training and handling in a patient, understanding, consistent and customized manner will flourish as they’re asked to handle new challenges. They’re naturally calm, confident and relaxed with a human who’s taken the time to introduce them to new (real) experiences only when they are ready. They come to see their rider (or handler) as a guide who’s proven they’ll keep them out of harm’s way. It becomes a case where if the human is relaxed and confident about the horse’s ability to handle a task, the horse is too. This approach can work with older horses too – but it takes more time to undo the damage. Horses are incredibly animals. Part of what makes them so is the fact that they’re all different. Formula approaches promising prescribed results rarely work. If you’re dealing with a horse that’s scared, timid or lacking confidence, forcing him to endure more frightening experiences under the auspices of ‘desensitizing’ certainly isn’t going to make him braver – or cause him to see you as a trustworthy guide. Sure, you can get him to stop spooking at plastic bags being flung all around his body (when will he really need to have this skill? ), but you won’t help him be confident (in you or his ability to figure out how to handle a task). Interestingly, most horses, when allowed to be part of the conversation, will come to be unflappable as a matter of course, provided they’ve come to view their trainer as one who considers their welfare and safety and asks in a confident, aware and fair manner. Have you considered asking your horse for help? Instead of trying to force your horse to accept what you throw at him (literally and figuratively), try asking him what he likes to do. Focusing on activities that allow the horse to excel with his proclivities will go a lot further toward building mutual trust and a safer riding experience than tricks purported to take the spook out of the horse. Don’t forget to immediately praise him when he does what you want. Best to find a way to do this that doesn’t involve treats. Most horses will respond more quickly and confidently to recognition for a good deed than they will for punishment when they do wrong, so it makes sense to also spend the time to figure out what he really enjoys. This may be a favorite spot to scratch, voice cues he understands as approval, time spent grazing after a good lesson, buddy time with one of his preferred equine friends, a quick trip on the trails, jumping after he’s done with dressage – figuring out what gives your horse great pleasure is your challenge. Come to recognize what that is and you’ll be amazed at how quickly he strives to please you. Regardless, your horse will be a lot more eager, less wary and increasingly focused on a partnership mindset to tackling challenges if you approach training activities with an ear toward what he’s trying to tell you. March into the ring (or trail, or course, or stall, or round pen) with a lesson plan and end-game in mind that doesn’t include his input and he’ll likely come to resent your time together (or respond by checking out to save his sanity). Few ‘bombproofing’ methods include the horse as a contributor. How’s he supposed to confidently thrive when you ask him to step up in naturally frightening circumstances if you fail to let him know his opinion has been heard and considered in earlier activities? Personally, I’d much rather be on a horse that reacts to his situation than one that’s been conditioned to ignore the things that may get you both hurt. In most cases, if you are calm and relaxed about approaching new situations, your horse will be too. If you do find yourself in a situation where you need help from your horse to extricate you from danger, it’s best to have one that has been brought along in a way that encourages him to think as a partner in the problem-solving process. There have been many occasions where I’ve turned the reins over to the horse to help get me out of trouble. Whether you find yourself bogged down in a swamp or unable to see a good spot as you approach a huge cross-country fence, it’s best to be aboard a horse that has been encouraged to participate in the training process. If you’re on a horse that’s been conditioned to be ‘bombproof’ bailing might be your best option. What are we really doing to our horses? So much of what people are calling natural horsemanship today is anything but. The stuff that’s being recommended as a kind alternative to normal training (whatever that is) verges on cruelty, in some cases. This whole notion of demanding the horse’s respect has gone so far most seem to have forgotten this is a two-way street. Expecting the horse to endure activities that are terrifying to ‘desensitize’ him to new frightening experiences is ludicrous. Forcing the horse into immobile positions where they’re defenseless, with instincts screaming vulnerability to attacks and calling it horsemanship is a misnomer. Think about it. How can you encourage your horse to tackle new challenges with vigor and glee if your training process teaches him his opinion doesn’t count and humans are to be feared and resented (or worse, survival instincts kick in and he shuts down his brain to endure the pain then proceeds in a robot fashion to comply with your demands)? Can novice horse owners apply these concepts? This isn’t such a complex concept to make it too far removed for novice riders to understand. Geez – books and DVDs being sold claim any level equestrian can work with horses of all ages to make them perfect if they simply follow the formula provided. In my opinion, this borders on criminal in some cases, but what I think we need to focus on is the fallout. Today we have a lot of confused riders and horses struggling with issues they’re ill-equipped to handle without the knowledge to recognize good resources to turn to. If you’re an inexperienced rider or horse owner trying to ‘bond’ with your horse, time and energy is better spent getting to know him and crafting a strategy that helps him feel good about doing what you want. You can’t do this by following a step-by-step process offered by someone who’s never seen you or your steed. But, you can learn how to interpret what he’s trying to tell you. Sometimes it makes sense to get a professional in to help. You might be amazed at how much you both can learn in a couple of hours for a minimal expenditure. The right trainer or instructor will be focused on teaching you how to do much of this yourself. For us professionals, it’s time we worked together to help novice riders and new horse owners find good information and resources. We can’t control what others are doing to encourage people toward poor decisions, but we can set our sights on offering good and accessible information to those people who have been left twisting in the wind with problems not entirely their doing. What do you have to share about horses? Are you a novice rider or new horse owner struggling with a challenge? Post it here and we’ll try to offer some ideas you can use or resources to check out. Are you a professional frustrated with the cases you’re handed after a ‘natural horsemanship’ start or have ideas on how others can avoid such situations? Please share your stories and advice. Are you an instructor with tips for new riders? Post away in the comments below. Thanks for reading and sharing. I hope we can get the movement going, together, with a new realm that focuses on ideas that include the horse in the conversation. Young horse training – am I nuts? As I’ve matured (and this can be very good thing), I’ve started to question the wisdom of risking my neck (and other body parts) starting young horses under saddle. It was a lot easier when a spill had me bouncing off the ground in a nanosecond through a practically seamless move that had me back in the saddle, unscathed. Now, I know my bones can break (always figured they were too big, solid and dense for this to be possible – you might too if you had walked away from horrific spills), tendons and ligaments complain after too many years of neglect or abuse and older body parts take longer to heal. Wouldn’t time travel be great? The beauty of a good photographer catching the right moment - I don't usually look this good (thin) - but this photo's only a few years old, so I guess I can call this image a relatively current depiction. How cool it would be if I could merge the fearless nature and athleticism of my younger self with the wisdom and horse sense I’ve gained over the last couple of decades. If only the horse reading and communications skills I now enjoy could be given to the twenty-something thrill-seeker who preferred a horse everyone else had been thrown from to one that was kind and agreeable. Unfortunately, time travel doesn’t seem to be an option right now (I’d use the young me as the crash dummy aid at the farm now and throw some experience into the mix to ensure the particular horses involved were understood and accommodated better). Still, I pine for the days when worry was never a factor in hopping aboard a horse and the excitement involved in sticking with a mount no one else could was my biggest motivator. Of course, I don’t miss the youthful arrogance, stupidity and ignorance. When time travel happens, I’m also going back to teach my younger self how to take better care of my body by stretching, letting injuries heal and toning down the bravado a bit. Now that I’m older I sometimes question why I continue to do this. Then, a horse comes along that reminds me how much of a difference my older self can make. It’s inspiring and invigorating to reach any horse in a way that creates a special bond, but this is even more evident with a difficult project. When LuLu shipped in, I was bit smug about the ease I’d have with a little horse that wasn’t the typical high-strung, speed bloodline bred Thoroughbred that comes into Halcyon Acres for training (when will temperament become a consideration in the TB racing industry?). By about week three, I was questioning my sanity and ready to kick this one back to the owner with a refund of her starting fee. I don’t know if it was pride, determination or a gut feeling, but I decided to hold the course and continue to try to reach this filly. We had made some GREAT early strides that made me believe this filly wanted a job (and a guide). Time was in my favor with an extremely patient and understanding owner. As discussed in an earlier blog post (http://horsesenseandcents.com/blog/975/starting-under-saddle-with-alpha-fillies-is-always-interesting-part-3-and-the-last-of-a-series/), we put this gal into serious training earlier than planned because of the destruction she wrought on the property and her penchant for terrorizing other horses. The first day was a nightmare, but the second day seemed like a remarkable and lasting breakthrough. It was, until we started working on putting a rider on her back. It took another two or three weeks of biting, kicking and acting out in some very creative ways before she would accept weight across her back. With alpha mares (well, technically she’s a filly at age three), you need to pick your battles. Early in training, it’s best to choose those you can easily win in a way that has the horse happy, or at least quickly capitulating toward the intended outcome. Get combative with an alpha and they’ll test your stamina, courage, resolve and talent in ways you can’t imagine. Usually, the most effective approach is to go extremely slowly initially, with the goal of building a rapport and understanding that encourages the horse to embrace training. So, we spent weeks putting weight in a stirrup and working to get LuLu to allow this without violent reactions (which were corrected, but ongoing). We always finished with her accepting what we had requested willingly, but didn’t push very hard for more. Some days, this took more than an hour to merely get her to stand and allow a rider foot in the stirrup. Of course, we continued to do groundwork training, which she was willing and eager to embrace, so we were making progress in other ways. Once LuLu was ready to accept a rider aboard, she blossomed quickly into a willing and eager mount. In fact, she was happily walking, trotting and cantering in the arena on our second day outside the barn. The next day, we hit the trails – which she tackled like a seasoned pro. Of course, ground work, particularly long-lining schooling with this filly, had her prepared to handle, understand and respond to rider cues immediately. She’s smart too, and learned to relish training, so she gets good and puffed up about mastering a request – which she does much more quickly and easily than most. It was wonderful to hop aboard this filly today with a Western saddle for the first time, hit the trails in a whipping wind, and know (after only three days in this environment) that she’d handle new terrain and sights with ease and confidence. In fact, she was steadier and braver than most of the farm horses with years of exposure to the property would have been in such gusts. What’s so rewarding about a project like this is the results. Funny thing is, this is a spooky mare by nature. She would have been jumping, bolting and shying at every noise and movement if being led along the trail. She gains great confidence and courage with a rider on her back, though, and her demeanor under saddle is unflappable. It’s weird how you can have two different personalities in a horse that is started under saddle in a way that considers their needs and encourages trust in the rider. We both had a ball being totally relaxed and confident in our respective convictions to take care of each other. In fact, I spent the trip with one hand on the reins (an owner objective) without concern. I also know if this horse had been forced into a human-driven training regimen during the early stages, this bold, kind and cooperative attitude would have never surfaced. With an initial slow, responsive and mindful approach to training, we achieved what would have usually taken 30-60 days under saddle in a week’s time – with a horse that will be much more confident and cooperative about every new task requested of her in the future. Granted, the groundwork time was extended, but future training time will be abridged with every new request. Plus, she’ll be a much more effective competitor for the rest of her life with the love for training and confidence in human partnerships that she’s gained. This gal has transformed from a hostile, bellicose and resistant witch into a keen student and eager pleaser. That’s why I continue to enjoy training young horses. The ability to reach a troubled horse in such a sublime fashion is an amazing experience. Doing this in a way that ensures the horse will be able to handle rider and intended career requests in the future makes the task even more rewarding. It’s also wonderful to be able to pass back such great successes to the owners and/or trainers that entrust Halcyon Acres to prepare their young horses for future careers. You might be asking, what’s LuLu’s intended lot in life? Sights are set on her being a competitive trail horse. She’ll be a great one. LuLu may be even exceptional enough to put her savvy ‘always learning’ owner on the map. Both have the right attitude to make it so. This is probably a first for this blog in terms of requesting anything besides more cognizant approaches to horse breeding, care, handling and training methods. Now I need you. This blog is just over a year old now (can you believe it?). Do you have ideas on how we can celebrate this milestone? Please brainstorm away in your comments below or through personal e-mails to me. Also, feel free (please) to point anyone to this blog that you think may enjoy or benefit from the free content. Look for our free newsletter launch in the coming weeks and please sign up (and tell your friends about it). As most of you probably know, we launched the Horse Sense and Cents™ book series this year. Our authors are people who want to give back after enjoying an equine career that has been helped by the kindness and wisdom of others along the way. They are also determined to provide honest comment on their experiences and share mistakes made to help you avoid the learning curve they may have suffered the hard way. These contributors do this because they care about the horses and people who may be challenged with issues beyond their scope. Interestingly, equine professionals are embracing the series concept and implementing ideas and tips provided in the first book (it was created largely in response to the angst so many inexperienced horse owners were facing after being left twisting in the wind – and, of course, the pain we’ve seen horses put through due to misunderstandings) with good results to problems they have struggled with for some time. Novices are getting it too, and we’ve included a glossary as a feature for every book to explain terms that may be confusing to make understanding a lot easier for less seasoned equestrians. These books are designed to be a fun read for all with easy to implement ideas to experiment with on a particular horse. This comes from an anecdotal approach throughout so readers can enjoy the stories and see how certain equines have responded to what we humans may throw at them. Bulleted points are also featured at the end of core chapters to cull out key issues to consider as training prompts. So many have found good intentions turn to frustration by trying to follow formula approaches that rarely work well with every horse. We hope we’ve provided a better path toward horse and human happiness and are planning a lot more for the Horse Sense and Cents™ initiative. You won’t get pat answers claiming to solve all your problems, but you will get ideas on how you can learn to read, respond to and connect with your horse in ways you may not have imagined. We also feature an entire section that draws from the vast knowledge of respected discipline professionals from around the globe with some real characters and a good number of highly respected international players. “Turning Challenging Horses into Willing Partners” is now available via Ingram, Amazon, our website (the shopping cart is at http://www.BookConductors.com but you can also get to it through the http://www.HorseSenseAndCents.com site – simply click on the books icon at the top) and distributors in the EU and UK. We’ll be making e-books available in at least three formats in the coming weeks. Please tell your friends and colleagues about this book and encourage them to check it out. They can see excerpts on the blog (under the category of ‘Books’ and ‘Turning Sneak Peeks’) for free. We want to get this book into people’s hands because we think it could start (along with other plans) a revolution that makes life better for the horses and people in their lives. This is true of all books planned for the series. This initiative is a passion for all involved – we’re trying to reach people with horses before they suffer consequences they may not be able to reverse. “Bringing Up Baby” by Robert Fera is in the works, along with “Don’t Get Thrown Starting Under Saddle.” We also have two exciting titles planned in the next year that break the mold relative to equine activities that we’ll announce once we get closer to publication. Please tell your friends, colleagues, family, business partners and networks about this blog, the books and our plans to create a movement. Ever wanted to be at the forefront as a trend-setter? Now’s your chance J.
P.S. Call (888) 875-3551 or (585) 554-4612 if you want a personal message in a book signed by the author. We’re also in the process of setting up the shopping cart on the website to not only deliver signed books with a personal message, but also include gift notes for orders for others.